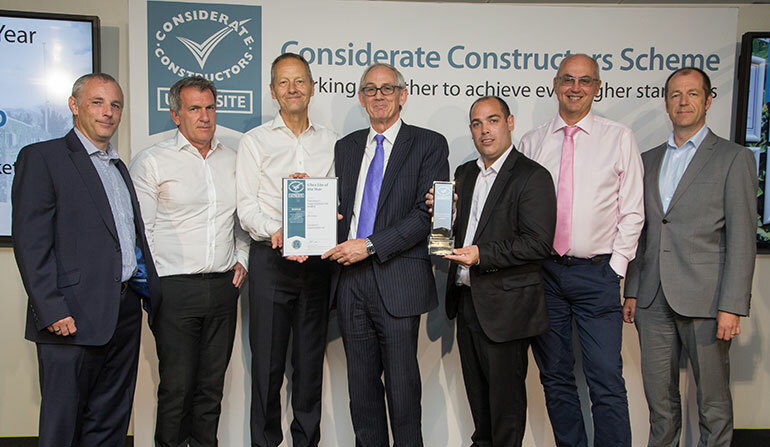 The inaugural National Ultra Site Awards took place on 12 July 2018, marking an exciting movement towards greater collaboration across the construction industry. 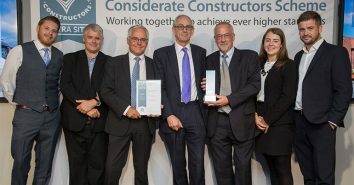 The Awards are a momentous occasion for the entire construction industry; representing significant progress in how construction sites, the supply chain and clients are increasingly working together to raise standards throughout the construction process. 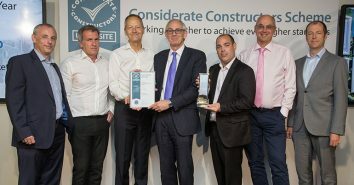 As a model of best practice for the industry, the ultimate objective of Ultra Sites is to provide the next level of achieving even greater standards and collaboration across the entire industry – to improve not only their own performance but that of the wider construction industry, particularly through their supply chain. The Awards recognise top-performing Ultra Sites in 10 categories of excellence. Each category represents the key attributes of being an exceptional Ultra Site, from collaboration to community engagement, client recognition and innovation. 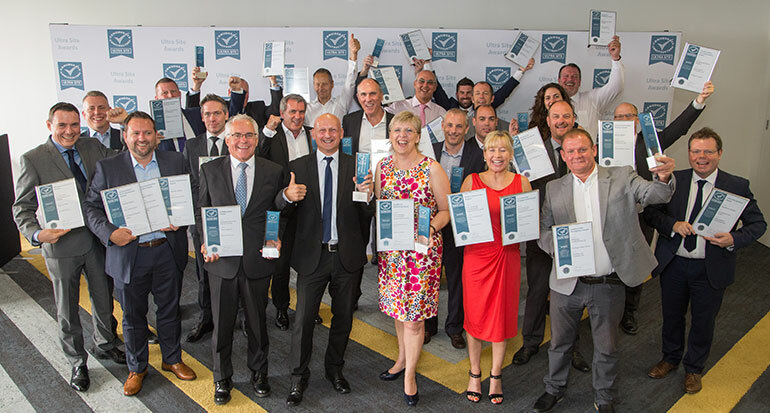 See below for all of the winners at the 2018 National Ultra Site Awards and case studies on how they have reached this exceptionally high level of achievement. This project involved the construction of a new Sainsbury’s superstore over two phases. The first phase was to create a new temporary store and the second phase was to build the main store and connect this to the temporary store, enabling the existing store to remain open throughout the contract period. The second phase also included a two level car park facility, a hotel over two floors, a gymnasium and the refurbishment of the existing town centre car park in the basement. It also entailed the demolition and reconstruction of a large canopy to the adjacent theatre and library, as well as improvements to the public realm in the town centre including highway modifications. Client, Sainsbury’s Supermarkets Ltd demonstrated enormous vision and perception in the way it embraced this Ultra Site project. The site’s request for Ultra Site status was a joint decision by both Sainsbury’s and RG Group and showed how collaborative working can truly benefit all those touched by such a large and complex project. An outstanding industry first impression was made with all areas kept scrupulously clean and set off with attractive di-bonded hoarding featuring an ivy-covered brick montage design. This warm welcoming environment ensured that customers were undeterred by the live redevelopment works taking place within. Staff seized every opportunity to utilise the project’s first-rate accommodation and were quick to volunteer for a number of life-changing community projects. These included providing blankets for the elderly during the winter months and donating Christmas gifts for disadvantaged children. Members of staff also orchestrated their own community initiatives such as renovating a large shed at a local allotment and various local painting and repair works. They even had their profiles displayed on the site hoarding. While some clients might be content just to display the Ultra Site badge of honour, Sainsbury’s lived the Scheme and embedded its DNA firmly within every facet of the project, leading the way for clients industry-wide. This term service contract consists of repairs, improvements and highways construction works on all categories of highways, other than motorways, throughout Nottinghamshire. Sites and projects are multiple with short durations (from a few hours to no longer than six weeks) and vary in value according to the range of works carried out. The work involves surfacing, street works, pumping stations, civil engineering and drainage. Work can either be planned or emergency and reactive, and is carried out in a variety of rural, semi-rural, suburban or urban areas. The project also entails road closures or putting diversions in place, as well as some night working, dependant on the nature and location of the working site. The headquarters/depot is based in a modern office at Bilsthorpe, Nottinghamshire. Tarmac set new standards for the industry on this contract by being the first multi-site, term service highways contract to operate as an Ultra Site. Recognising the need for extensive collaboration to ensure overall success, the team worked in close partnership with the client, local authority and its supply chain partners from the very outset. Throughout every stage of these short duration projects the team held bespoke stakeholder liaison meetings with all those affected by the works including local hospitals, schools, businesses and neighbouring residents. Working with up to 10 of their supply chain partners on each job, Tarmac completed the schemes on time and within budget, despite several weeks of bad weather. This was testament to the team’s collaborative relationship with all those involved to ensure any hurdles were overcome during the works. These extraordinary levels of communication also resulted in incident and accident-free projects. 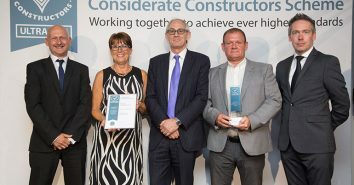 While it is challenging enough for multi-site projects to achieve standards of best practice, this inspirational contractor set new benchmarks of collaboration and leadership as a worthy Ultra Site ambassador. Robertson’s largest ever project, the Aberdeen Exhibition and Conference Centre, will boost the region with a world-class stadium, conference and hotel facility in Aberdeen, combined with an innovative energy centre. The new Aberdeen Exhibition and Conference Centre will provide four times the exhibition space as the current AECC and increase the maximum capacity to 12,500 in the arena. Located next to Aberdeen Airport, the new facility is a key element of Aberdeen City Council’s Strategic Infrastructure Plan to grow the city’s economy. Generating lasting social value on their AECC Ultra Site is being achieved by Robertson with truly life-changing results. Encouraging young people into the industry, the project team work in partnership with a local high school to deliver a bespoke Trade Route programme for pupils aged 14 to 16. Employability skills are taught through workshops and students are guided through every aspect of the job application process with a tailor-made ‘Ideal Candidate Workbook’. 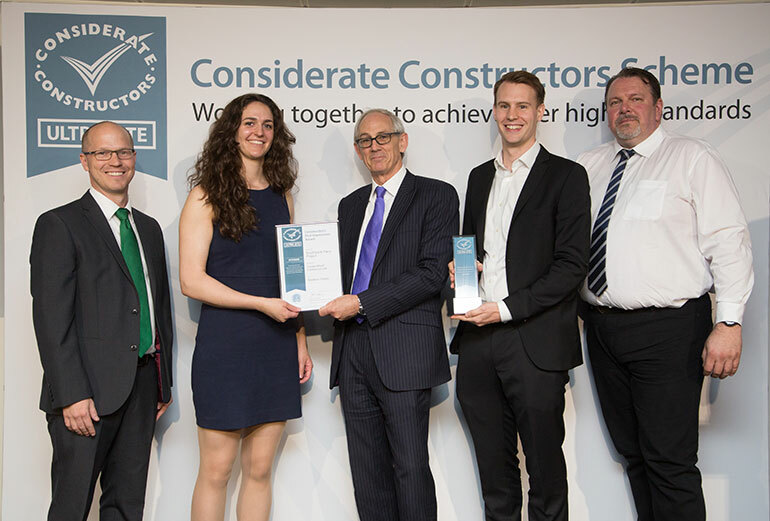 A work placement programme with a local college motivated students to pursue professional construction careers at university, and a similar initiative led to an unemployed man becoming a trainee quantity surveyor with Robertson. All of this, along with boosting a local children’s charity by over £8,000, and the support of many local organisations, shows this team’s incredibly dedicated and far-reaching community spirit. This project involves the demolition of much of the Shell Centre site at Waterloo, London (retaining Shell UK’s iconic tower building) and the creation of new offices, apartments, retail units and improvements to the public realm. The mixture of offices, homes and retail space will integrate with open and attractive public areas, while new pedestrian routes will connect nearby Waterloo Station with the South Bank of the River Thames. A widened Chicheley Street will open up the approach to the London Eye, while a city square at the heart of the scheme will provide open space and help people move around the area. The well-known Shell Centre Tower will remain the flagship of the new site, occupied by Shell which is taking a further 245,000 sq ft of space. The Tower will be complemented by eight new buildings, one of which will incorporate new offices and trading floors for Shell. Approximately 530,000 sq ft of office space, along with around 48,000 sq ft new retail units, restaurants and cafés, will be accompanied by approximately to 877 new homes, including affordable housing. The proposals for the development also incorporate a highly efficient energy centre which will reduce the carbon footprint of the site. Taking full advantage of its prime London location, Canary Wharf Contractors’ Ultra Site is creating a superb first impression with its attention-grabbing, educational and multi-media surroundings. From the outset of this project, the marketing team devised a hoarding design strategy which moved away from simply advertising, to instil a captivating sense of place and time. A larger than life narrative of this iconic landmark’s past, present and future is displayed on each section, from the project’s environmental targets to last year’s award-winning Ivor Goodsite Hoarding Competition entry. Attention-grabbing community notice boards and digital screens keep the passing public in the loop about everything from weather forecasts, to TfL travel updates and even project time-lapse videos. A mesmerising interactive optical illusion using mirrors was the brainchild of two architecture students, adding yet more interest and intrigue to this ground-breaking industry presentation. This is undoubtedly a shining example for the rest of the industry to follow. Mulalley’s second Ultra Site, the Chauncy Residential Development in Ware involved the construction of 18 semi-detached houses, 29 apartments, car parking and amenity space. 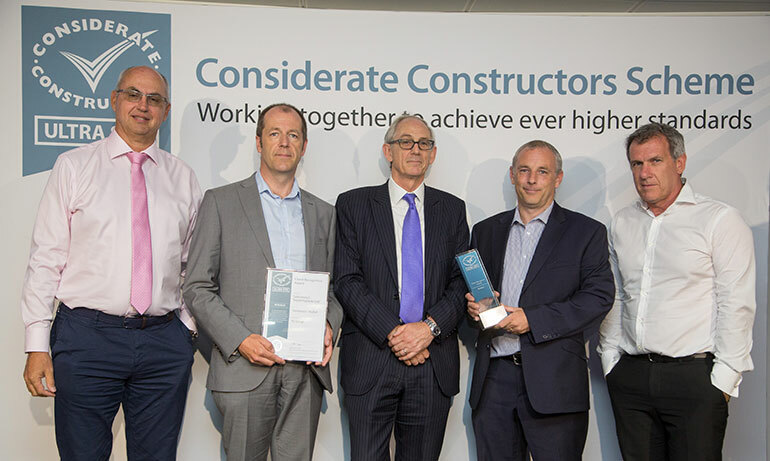 Delivered for Network Homes, a Client Partner of the Considerate Constructors Scheme, this £8.7m project was crowned as the Scheme’s 100,000th site registration in 2017. The Chauncy Residential Development was completed at the beginning of June 2018, with some of the houses finished early and occupied by residents in April. 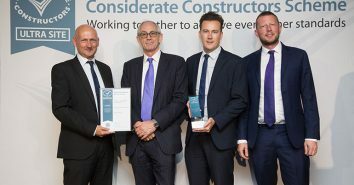 With Mulalley maintaining its carbon neutral status for a second year running, it comes as no surprise that its Chauncy Ultra Site in Ware has achieved impressive environmental credentials. Reducing their carbon footprint using a multi-pronged approach, the Mulalley team used hybrid generators with auto engine switch-off, along with energy efficient cabins. 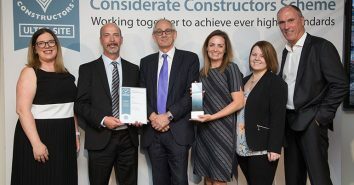 Leading the way as a CLOCS Champion has further reduced their carbon emissions. This is thanks to smart routing of deliveries, anti-idling and the use of fuel-efficient vehicles and techniques. The team has also significantly surpassed its 90% waste recycling target by more than 8% and promoted the site’s environmental performance in informative and interesting ways. An extensive tree planting programme of 380 trees will offset 165 tonnes of carbon, well above the actual energy used on site of 33 tonnes. This has resulted in a net positive carbon site, which is truly commendable. They have also reached out to the young generation with educational leaflets and eco card games. This team’s highly proactive and tireless commitment towards the environment will serve as an inspiration to, not only the next generation, but the industry as a whole. This major highways project is the UK’s biggest road construction contract involving upgrading and re-routing the A14 coastal trunk route, from the existing A1 just west of Huntingdon to the northern point of the M11, close to the A10 at Milton. Led by Scheme Client Partner, Highways England, this Joint Venture project is being managed by a bespoke management team (IDT), created from experienced professionals selected from each of the company teams. 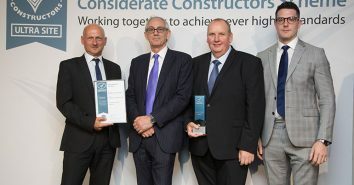 It is the first major infrastructure project to be recognised as an Ultra Site, which has provided a collaborative framework for contractors and the entire supply chain to work towards the same high standards. 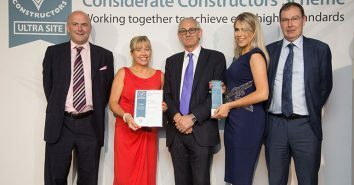 The A14 Integrated Delivery Team has developed multiple initiatives to encourage interest in construction, starting from nursery upwards, through its successful schools’ engagement programme. A dedicated STEM network of 83 members has attended over 130 careers-related events and activities, reaching over 4,350 students in over 30 schools and colleges. This positive engagement has resulted in 100% uptake in work experience programmes and a healthy talent pool to fill apprenticeships and vacancies. Its work experience programmes have been equally successful, providing practical working experience for 39 young people, 12 of whom have been offered permanent jobs. As well as supporting local charity and Prince’s Trust volunteers with much-needed skills and employment opportunities, the team collaborates with its supply chain partners and local training providers to fill many positions. The first project in its own right to sign the Armed Forces Covenant, the team also offers careers support to local prison inmates. 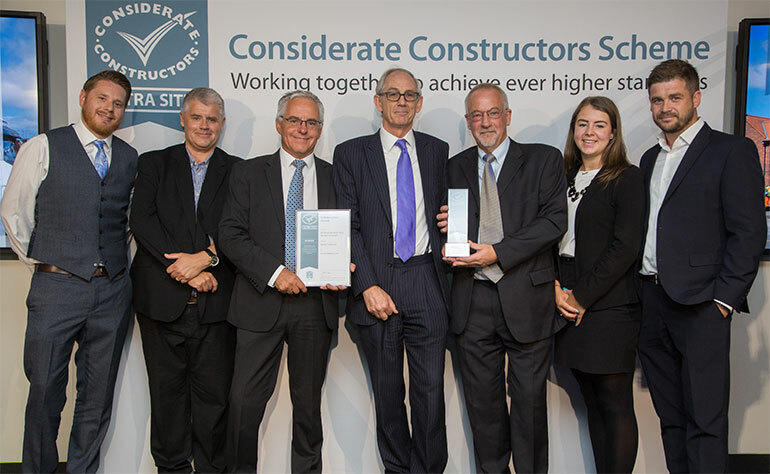 This truly diverse and collaborative approach to encouraging and enabling future constructors stands at the pinnacle of industry best practice. Scheduled to run to September 2019, this project involves the construction of 75 residential units for the London Borough of Hackney. The high-rise development includes 39 shared ownership, 28 affordable rent and eight private sale residences. This site is situated on a prominent street corner location in Homerton. The site is surrounded by established residential and commercial developments and all four sides of the site are accessible by the public. Impressively, Mulalley produced their own CLOCS Monitoring App, demonstrating leadership and innovation in utilising technology to improve efficiency and increase compliance standards. This bespoke app helps to improve data capture and minimises the risks of CLOCS check-forms going missing, as well as eliminating the tricky issue of illegible handwriting. It also vastly reduces the administrative time necessary to type up results. While there are various off-the-shelf applications which can be used, the company showed leadership by sourcing their in-house expertise to build their own app and fulfil their own specific needs. 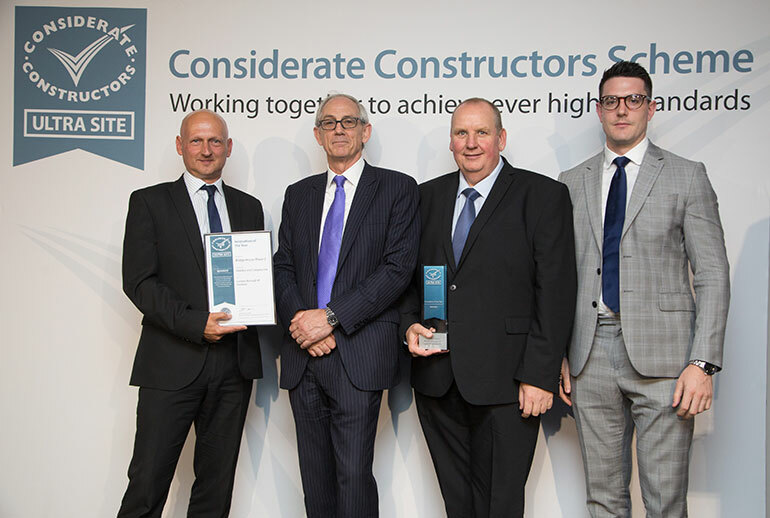 The maximum point score achieved on the CLOCS compliance checklist as a result of this application demonstrates its successful implementation, and further illustrates the contractor’s commitment to meeting CLOCS compliance standards. 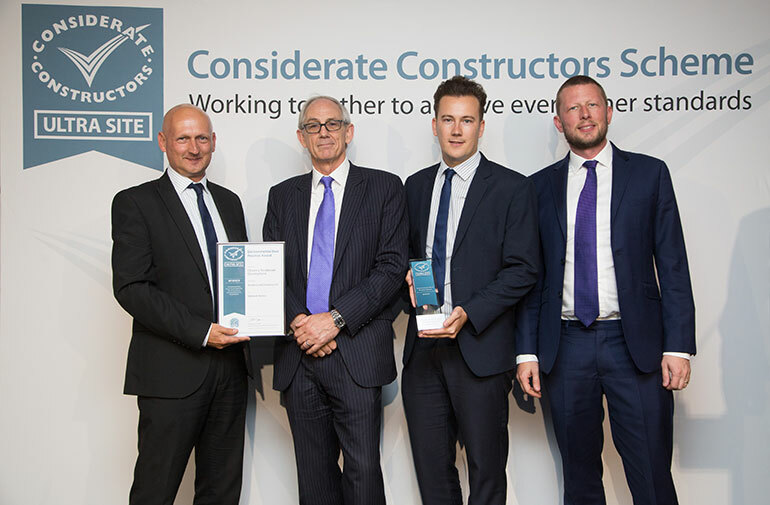 This leading-edge app is an example of what can be achieved through a combination of leadership, collaboration, inspiration and innovation – the very essence of the Ultra Site ethos – and the future of construction. Mulalley’s flagship project was an eight-year Decent Homes programme for the London Borough of Haringey, involving the internal and external refurbishment of social housing. Beginning in 2008 and completing in 2016, the project involved the modernisation of numerous blocks of flats and street properties. Mulalley’s operational hub was situated at the centre of the work zone which involved properties in Tottenham and Wood Green and spanned a 12-mile radius. Satellite offices and compounds were also established within the working district. Mattison Scaffolding wholeheartedly embraced the Ultra Site ethos, becoming a positive force for good as a supplier on this project. Mattison registered with the Scheme and engaged its workforce from the very outset, setting up a series of initiatives to improve health and safety, welfare and respect for the community. Taking its reputation extremely seriously, the company provided training relating to behaviour and avoiding nuisance. Operative feedback forms were reviewed at weekly meetings, with many useful initiatives implemented as a result such as an intensive training programme on respect and conduct. Another inspired development was the introduction of a ‘black hats’ programme to distinguish the lead scaffolder, and this was supplemented by a series of targeted toolbox talks dealing with issues such as how to handle confrontation. As well as attending Mulalley’s Supply Chain Workshop, Mattison also embraced the team’s continuous improvement workshops focusing on the Scheme’s Code and Checklist. 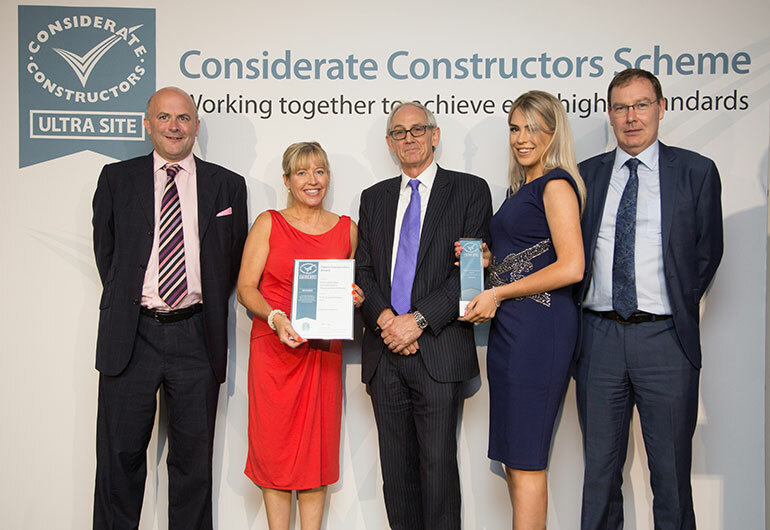 This highly constructive collaboration resulted in increased scores and a CCS Most Considerate Supplier Runner-up Award. 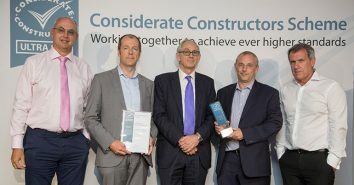 Mattison’s highly proactive contribution to this Ultra Site project was recognised by Mulalley through its own Supply Chain Awards, further demonstrating its credentials at the forefront of supply chain best practice. This project involves the construction of a new therapy unit within the grounds of the Royal United Hospital (RUH) for Bath NHS Foundation Trust. The Therapies Centre will house many of the services currently located at the Royal National Hospital for Rheumatic Diseases (RNHRD) and in the RUH, namely rheumatology, therapies and pain management services. Working in a hospital setting inspired this Ultra Site team to focus very strongly on the health and wellbeing of their own workforce. Every aspect of this project was assessed in terms of potential impact on mental and physical wellbeing, from ensuring spacious, modern and highly functional welfare and office accommodation, to site car parking and individual physical and mental support. All of these aspects were seen as crucial in maintaining workforce motivation, improving fitness, reducing sickness and creating a positive and respectful team atmosphere. One member of staff was trained as an accredited Mental Health First Aider and was based in a dedicated ‘wellbeing room’, giving operatives useful advice, or signposting them to the relevant support services. This was supplemented by an Occupational Health Advisor who provided free voluntary health checks to the entire workforce, with increasing numbers of operatives taking advantage of this facility. An interactive health kiosk was also scheduled for the autumn months – a period when the numbers of operatives employed on site reach a peak. This private setting provided operatives with immediate and confidential results, along with GP referrals if necessary. A healthy dose of workforce satisfaction came from operatives raising funds for the hospital’s charity appeal, knitting bobble hats for premature babies and donating toys to the children’s ward. 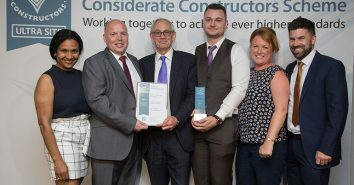 An injection of fun came from a number of friendly team competitions such as a darts championship and workers receiving safety recognition awards. This vigilant and highly inspirational team showed great leadership in placing the health and wellbeing of its workers at the very core of its motivations and operations. This project involved the construction of a new Sainsbury’s superstore in two phases. The first involved the creation of a new temporary store for shoppers to use while the main store was being built. This temporary store was of a similar size to the existing Sainsbury’s store, enabling business to continue as usual throughout the works. The second phase also included a two storey car park, hotel, gymnasium and the refurbishment of the existing town centre car park in the basement. It also entailed the demolition and reconstruction of a large canopy to the adjacent theatre and library, as well as improvements to the public realm in the town centre including highway modifications. The secret of this site’s resounding success was exceptional leadership. Team Redhill took the Ultra Site initiative extremely seriously, fully embracing the ‘one team, one vision, many values’ approach. 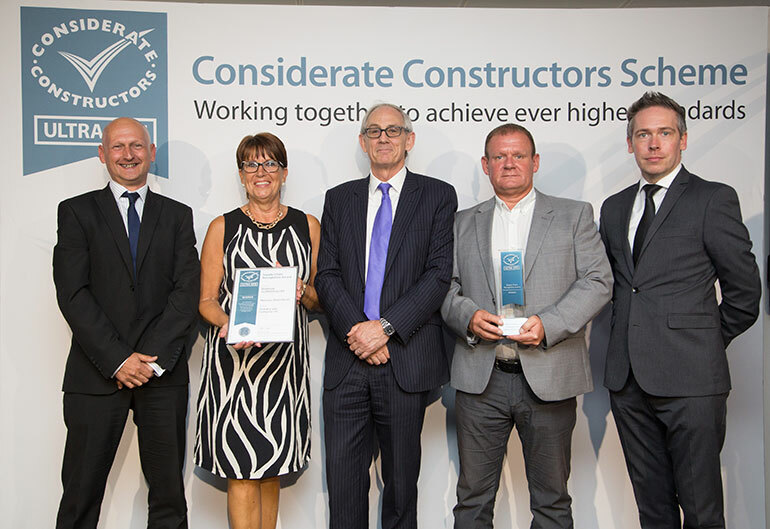 They set out on a journey to see how they could take considerate construction to the next level and their enthusiasm emanated to all around them. 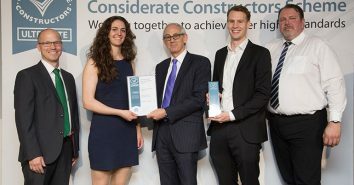 Setting themselves challenging targets, the team wanted to be a significant contributor to the Scheme’s Best Practice Hub, achieve carbon neutral status and promote the industry community-wide. They also had some of the best site accommodation and facilities achievable on a project of this type. 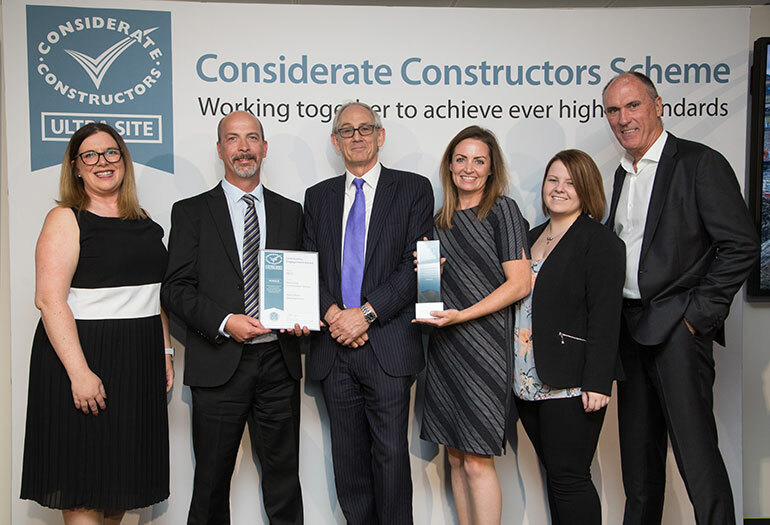 All of this was not just down to the project team, but to all of those working on site, spearheaded by strong and positive leadership arising from the collaboration with client, Sainsbury’s. For visitors, the impressive image started with visually attractive di-bonded site hoarding and moved onto a very well equipped visitor centre, welcoming site staff, efficiently managed reception area and a stunning suite of offices and welfare facilities. Community initiatives were many and varied, including working with local schools, colleges, a local football club, the Rotary Club and a number of charities such as the RSPB. Safety initiatives were of the highest order, with systems in place caring for the safety of the public, visitors and workforce; these included developing a Pokémon Go type tool for hazard identification. Facilities to support and care for the workforce included first-rate accommodation, such as a restaurant with a TV, sofas, a sports zone, healthy meal options and a fully equipped gym. All of the amenities were accessed from a very attractively constructed podium area containing digital screens, a herb garden and many other positive features including a marketplace trading board to allow the workforce to buy and sell items. As well as taking WISE and STEM initiatives to a number of schools and colleges and hosting careers events, the team also took on many trainees. This exemplary Ultra Site demonstrated a high level of collaboration and leadership, helping to raise expectations and aspirations. 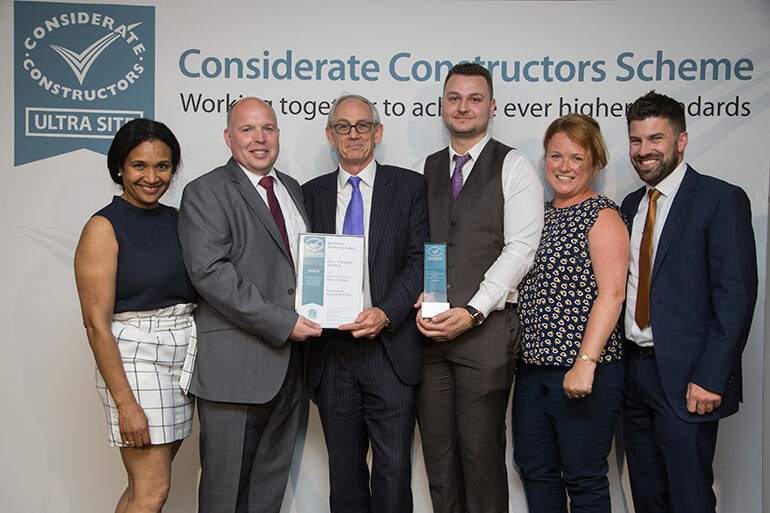 Follow the Scheme on Twitter, Instagram, and LinkedIn and remember to use #ccsawards #loveconstruction in all of your communication to join the awards conversation!